Socket has released the latest version of their industry leading Cordless Hand Scanner (CHS) Software Developer Kit, SocketScan SDK version 10.1. The latest version includes many new feature and benefits and is also compatible with Apple’s latest iOS 8 operating system. Advanced features in the SDK include data editing and Softscan (to use the iPhone and Android built in cameras as a scanner). Featured benefits of the SDK include allowing developers to build a scanner enabled application so all of the limitations of HID mode are removed. Other benefits include unlimited character set, end-to-end error checking, multiple cursor fields and program control for scan data placement. The new SDK provides support for Socket Mobile’s model 8Qi 2D barcode scanner announced earlier this quarter. The 8Qi is the smallest and lightest 2D barcode scanner available in the market today. The 8Qi can be attached to most smartphones including the Apple iPhone, iPod touch and Samsung S4 devices in a “sled type” configuration. The 8Qi slips neatly into your pocket and fits comfortably in the palm of your hand when attached to a smartphone. You can add a lanyard or belt clip for a wearable solution making the 8Qi accessible at any time. 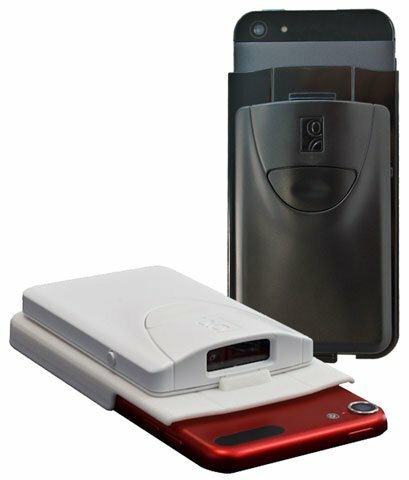 The Socket Mobile SDK also provides additional features and benefits for mobile point of sale (mPOS) customers who want to utilize the Socket QX barcode scanning stand (QX Stand) to securely scan their electronic coupons and loyalty cards by passing them under a Socket Mobile 7Xi or 7Qi 2D barcode scanner in auto detection mode without relinquishing control of their mobile devices. As developers continue to expand their mobile point-of-sale and business applications, Socket Mobile is focused on being a front-runner in the barcode scanning arena. Socket barcode scanners are used in a variety of mobile applications such as mobile point-of-sale, hospitality and healthcare. Designed for mobile use, Socket scanners are easy to use and effortlessly connect with smartphones and tablets using Apple, Android or Windows operating systems. For assistance finding the right Socket device for your needs, contact us at BarcodesInc.